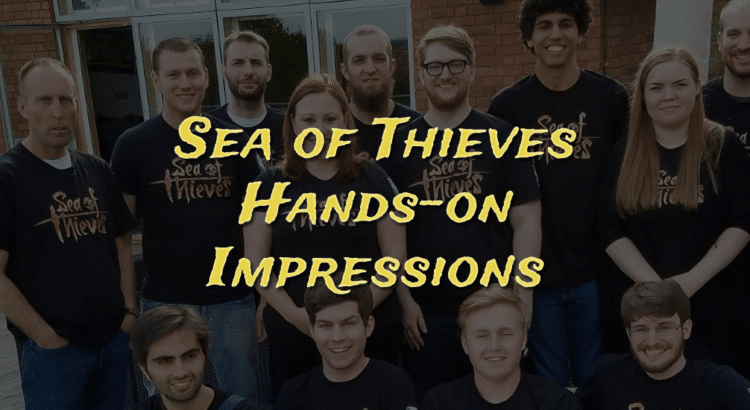 If you hadn’t heard, Rare recently held a contest where its winners would be the first in the world to play Sea of Thieves. Along with the six successful winners, six more lucky superfans were able to accompany them for the experience. 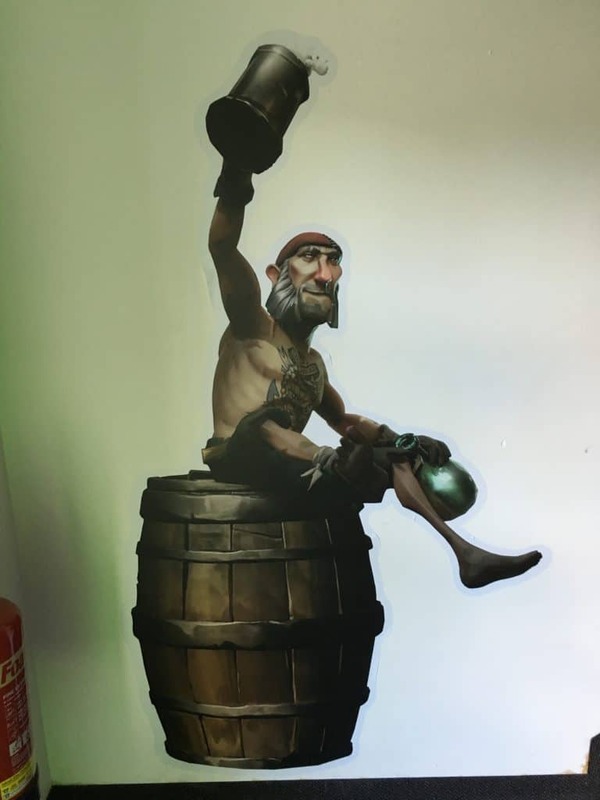 I was one of the six lucky superfans who went on this epic trip and below are my hands-on impressions of Rare’s upcoming pirate adventure! After meeting the passionate team behind Sea of Thieves, and given a grand tour of Rare, it was time to play the game. 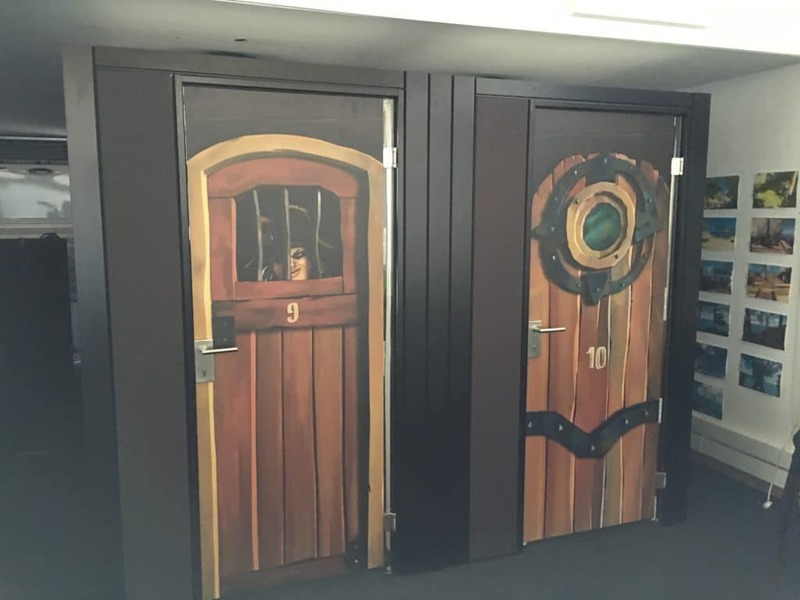 We were lead into Rare’s brand new online streaming center stocked with individual streaming booths fitted just for Sea of Thieves. Each booth was rigged with a television, lights, chair, camera for recording the player and a controller to play the game. Right next to these booths was a command center so to speak equipped with screens showing each player’s face and their game output, as well as the audio for that booth. 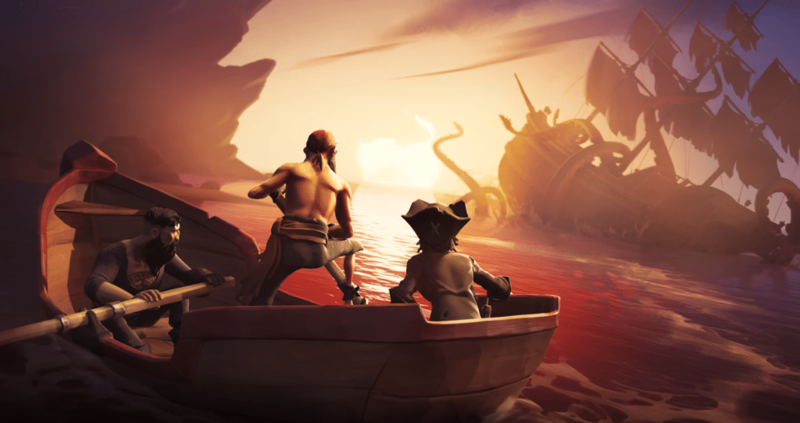 Rare is very focused on the online streaming community and has made it a priority in showing their vision for Sea of Thieves. We each were lead into one of the twelve sound proof booths and got comfy awaiting go time. On top of the equipment I mentioned each booth had a green and red light to signal when to start and stop playing. We each sat down in our individual booths, put on our headsets and awaited the the green light. The televisions were off as we waited to start but the game was running. During the wait we had the chance to really appreciate the incredible sound design that will be in Sea of Thieves. From our headsets came the sounds of wind, parrots, crabs scurrying through the sand, flies and rustling foliage. Before being given any visuals we were already immersed in this pirate world Rare has been creating. I want to preface my experience with the game by stating the team working on the Sea of Thieves didn’t tell us anything about what we were going to play. We had no idea what to expect, and there wasn’t any instructions or a tutorial. We were just going to be set free. The green light turned on and with it the television. I was treated with a gorgeous beach lush with green plants, pink flowers, rich coarse sand and the other players in my crew. Being excited to play Sea of Thieves for the first time, my crew in the game all jumped around each other admiring the character models and switching through our inventory which consisted of a mug full of grog and a wooden plank. Each of our characters were very unique and extremely detailed. One of us had an eyepatch, body full of tattoos, a scary looking metal claw for a hand and a peg leg while another one of us looked a little less menacing with some small piercings and a bandana wrapped around their head. This level of detail into the character models really made your crew feel like a real ragtag bunch of pirates. It also made it easy to distinguish one another especially against other crews. So about that grog…yes before we did anything else, we all equipped the grog, dipped our heads back and downed it all. Shortly after we were made aware of the consequences. The screen became a bit wobbly and it was hard to walk in a straight line. Later in another play through we drank grog before a ship battle and firing cannons while intoxicated proved to be rather difficult but hilarious. After stumbling about the island for a few minutes letting the drink wear off and appreciating how beautiful the game looked in such an early state, we decided to head for a ship docked near by. This is where the real magic started. All four of us jumped on our ship from the dock with the intent to set sail, but no one had told us how. So we talked amongst ourselves. “I bet the anchor needs to be raised,” one of us said aloud. We all thought that sounded right and searched the ship to raise the anchor. We quickly found in the middle of the ship the capstan which is used to lower and raise anchors. One of us interacted with the capstan to start raising the anchor as prompted and the character grabbed hold of one of the pegs attached and started rotating it around its center. It was going very slow and I noticed there was still a prompt to raise the anchor so I did the same and then all four of us jumped on and raised it in no time. Each additional person on the capstan sped up the process. So the anchor was raised but still no movement. We then noticed the sails were still rolled up making them our next priority. We followed the ropes from the masts down to the side of the ship which led to a pulley and were prompted to set the sail length. As soon as I interacted with the pulley to set the length, my view from the pulley turned to the mast and nothing happened. Okay, so now what I was thinking? I pressed down on the left stick and “voila”, the sails started to lower and the ship started to move. Hooray! I passed on this new found knowledge and my fellow crew mates did the same to the other two masts. Shortly after, we were soon focused on the sound of flailing ropes. It turned out that our sails stopped catching the wind. The wind is clearly shown in the sky without being distracting. It is in the form of small, thin, white lines in the air drawn in the direction of the wind. You can use the pulley directly behind the one used to set the length to set the angle of the sails. As soon as you catch the wind with the correct angle, the sails puff out as a visual queue that you have set them correctly. When they are set in the opposite way, the sails make a rackety sound. Last thing to do was grab the helm before we ran into some rocks. One of us volunteered to be captain and steer the ship. We all decided to head to this large island on the horizon. Another visual queue we noticed while playing was the ship wheel had gold pegs that are visible when the wheel is positioned in the left most, right most and center position. Along with the visual queue was haptic feedback in the controller. Without these hints you might find yourself continuously swerving left or right while sailing. On our way to this mysterious island, one of our crew mates spotted sails of another ship from the crow’s nest. Feeling rather confident from mastering the ship sailing abilities, we all decided to head over and prepare to engage. As soon as we thought we were in range, three of us jumped on the cannons while our fearless captain lined the ship up to take the shot. We started firing cannons as soon as we thought we were in range and almost immediately after we heard and saw return fire. At times it was a little difficult to tell if you were making contact with the enemy ship due to distance and waves blocking your view. A helpful feature in Sea of Thieves is a music queue for when one of your cannonballs makes contact. Only you can hear the music for your cannons. It was thrilling as one by one my team and I would yell out that we could hear music for each hit. The ship battles themselves are glorious to watch and be apart of. Puffs of smoke billow from the cannons, cannonballs fired from the enemy ship whizzing by your face and pieces of wood flying in the air from contact. All of this happening while you skim by rocks and islands with the waves crashing over the bow. 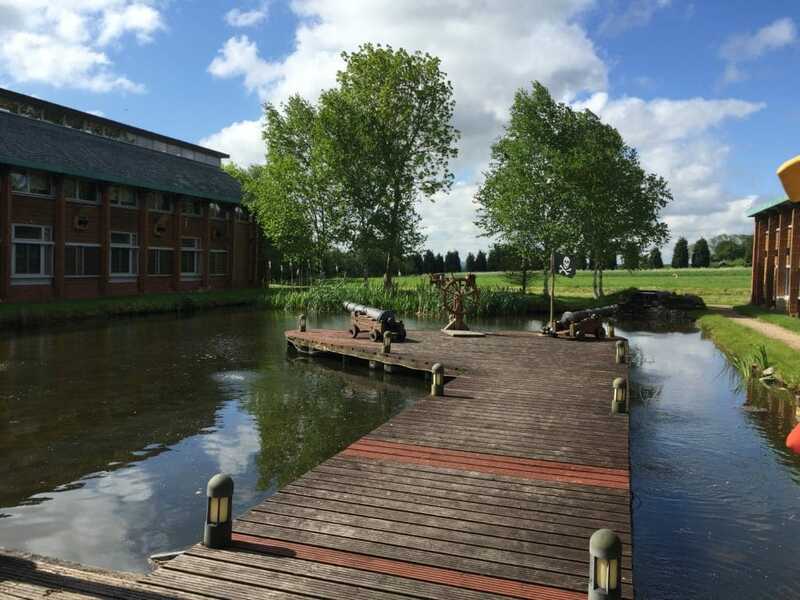 So there we are laughing and smiling as we exchange cannons, and then one of us noticed the sound of rushing water. I hop off the cannon and run down into the hull of the ship only to be greeted by several holes with leaking water. I run up to one of the holes, and I am prompted to repair it but can’t. Aha! The wooden plank from my inventory I equipped earlier! I equipped it and soon repaired that hole and the two other holes in the side of our ship. After a successful first pass, we start turning to make a second pass, but quickly realize we hadn’t been paying attention to our surroundings and are about to hit a huge rock protruding from the sea. One of us gets the bright idea to drop the anchor in hopes of stopping in time. Doing so, we learned a pretty strategic flip maneuver that not only prevented us from running our ship into this rock, but also positioning ourselves better for our next round of cannon fire. We start setting up our second pass, but are rained on by cannonballs from the other ship while moving into range. I hear the sound of leaking water again and hop off the cannon and head down stairs to start repairing the holes. My crew mates let me know our ships are about to run parallel to each other. I can hear the cannons being exchanged and the hull is filling with water. I run up to the higher level of the hull as the lower is filled all the way with water. This higher level is also riddled with holes and the ship really starts to sink. Some of us make it off this ship but I unfortunately was stuck in the hull as we capsized to the depths of the ocean. Shortly after my screen turned dark we all spawned back on a new beautiful beach. After the first play through, we all were amazed at how easy it was to command the ship! No one was assigned a role. In one moment I could set the sail length, run up to the crows nest to spot a ship and jump down to fire cannons at this same ship. This freedom really made it easy and fun to sail a ship in Sea of Thieves. Every encounter was fluid and you always felt like you were doing something for the group. With each session we learned more about the mechanics and how better to utilize them. In our first play through my crew was just firing cannons blindly at the enemy ship. It turns out that if you shoot the bottom part of the ship first, it will fill the lower hull causing the ship to sink and fill the next level of the hull. Makes sense right? In another session as we are exchanging cannon fire side by side, one of the opposing ship’s crew members jumps down from their crows nest onto our ship! He then quickly runs over to our anchor and lowers it leaving us dead in the water. We didn’t figure out what had happened until it was too late. Saboteur! Another strategy we implemented on our second play was to raise the sails half way. When the sails are down the captain cannot see so other players help direct them from the front of the ship or in the crows nest. Raising the sails halfway did cut down our ship speed, but allowed the player on watch the freedom to put their efforts elsewhere. Speaking about the person steering the ship and their view, the captain could help direct the cannon shooters with the angles of their shots as the helm was raised higher than the cannons. Once we were more comfortable controlling the ship, later on the person sailing the ship would line us up correctly and then run down to a cannon giving us the optimal amount of fire power. One of the biggest takeaways after playing three different sessions with this build of Sea of Thieves is the foundation of ship sailing and battling is remarkably intuitive. It was really impressive to me that myself and three other crew members in a matter of minutes were able to traverse the game world with ease in our huge ship with zero prior knowledge. Another thing I am left with is Sea of Thieves is a blast to play. Since playing I have a terrible itch to play the game again. The cooperative gameplay, huge open world, first person view and pirate theme make it easy to immersive yourself into the game. With just the focus on ships there was still always something fun to experience. You could be coordinating who is steering and who is firing cannons while a barrage of enemy cannonballs fly towards your ship. In one moment you are ensuring your sails are catching wind so you can quickly maneuver around an island for cover, and, in the next, yelling to the captain that you are about to hit a small island while the captain is yelling back at you to aim your sights up because your cannonballs are falling short. The cooperative play and communication during tense moments like these makes Sea of Thieves a memorable and very rewarding experience. No matter what role you are playing in that moment your actions help contribute to sinking or evading an enemy ship. And, of course, you and your crew can avoid all the commotion and just sail in the open waters looking for islands to explore. Sea of Thieves is a gorgeous game with extremely well thought-out and implemented gameplay. 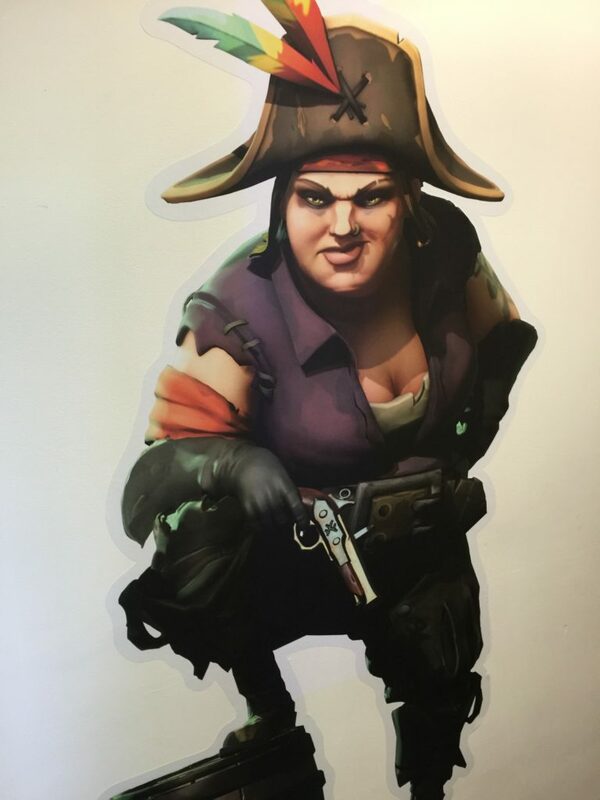 If you have been reading any Sea of Thieves news, you have heard Sea of Thieves is based on player driven stories. I can confirm that the sandbox Rare has created more than facilitates this gameplay. Each crew had different epic stories to tell after each session. Someone I played with recalled when he accidentally fell off their own ship onto ours, but it worked out because they were able to lower our anchor and swim back to theirs. Another person wanted to let everyone know how irresponsible his crew was. While he was busy steering the ship into safety, his crew was drunkenly trying to set the sail angles to gain speed. One of my favorite experiences was when all three crews we were playing with agreed to a truce and met up in a tavern for drinks. As soon as the two other crews started to down their grog, I signaled to my crew to bail and commandeer the three ships docked outside. My face started to hurt from laughing so much as we looked back to see the other two stranded crews. I swear I am not that evil in person. Having time to reflect on my play sessions, I really believe Rare is developing something extraordinary. As many of you have heard by now, people have been saying this is Rare’s most ambitious game yet and I would agree. Not only that, but I believe they can deliver. During my visit to Rare I met a majority of the team working on Sea of Thieves. Each person I met was genuinely excited about Sea of Thieves and really believed in the game they were building. The positive and creative energy in the studio while we were there was felt by each of us visitors. The team knows they have something special to share and after playing it, I believe it as well. Not only did we play the game but we were lucky enough to see what Sea of Thieves looks like going forward. Unfortunately I can’t say what that future looks like exactly. 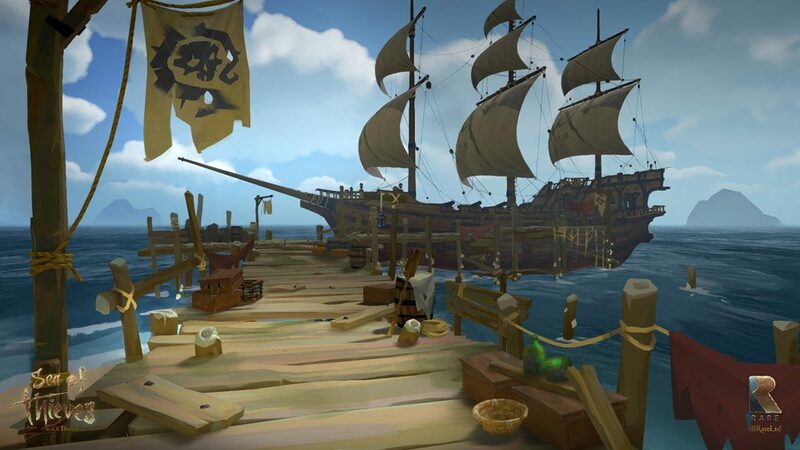 I will say that Rare’s vision for Sea of Thieves is very unique and can deliver that next-gen experience many of us have been waiting for. With Rare’s focus on making Sea of Thieves a streaming friendly game and the planned features for the game, Rare showed me that Sea of Thieves is going to have a huge and lasting presence and I am really excited for what the future of Sea of Thieves holds.